Back when I was a child, the milk came in glass quart bottles and was delivered right to the front door by the milkman. The bottles had just little paper caps that popped in the top so the milk did not spill. I could always hear the milkman coming, the clinking of the glass bottles and the sound of his truck. We had a nice milkman named Bill. He drove a truck that had Meadow Gold Milk printed on both sides. My Mother would stick a note in the top of the bottle if she wanted something more than the regular two quarts of milk. Sometimes she would get cottage cheese for Daddy. He loved cottage cheese. Or, maybe she needed butter. He had butter, too. If we were good, and she had the money, she would get a quart of chocolate milk for us kids once in a while. The only other time we got chocolate milk was when we made it with cocoa. That was hard to do. It never tasted as good as the milkman’s chocolate either. I would mix cocoa and sugar and put it in the milk, but it never would dissolve all the way. I would stir and stir until I got tired of stirring, then I would just drink it. I wished all the time that the milkman would leave only chocolate milk. Margie and I were talking one day about this very thing. “Don’t you wish that we could get all chocolate milk every time the milkman comes?” I asked. “Did you ever taste it with chocolate milk?” I asked her. I started working on my plan right then. I had to figure out how I could get the note out of the bottle to change it. The milkman came early, too. Sometimes he came before she went to work, so those days were out. However, there were days he came after she left for work. It would have to be one of those days. We were out of school for the summer, so all I had to worry about was Junior and Margie. Margie already knew what I was going to do, and Junior was asleep all the time, so he was not a problem. I just had to wait for the right day. I had been practicing what to write on the note. Mother usually just got two quarts of milk. I figured I could just write two quarts of chocolate milk. That should work. I didn’t see why not. It never occurred to me that the milkman knew my mother’s handwriting. Well, you have to remember I was only about eight years old. “This is not going to work, Ruthie,” Margie said. I heard the milk truck coming, and I was getting a little nervous. I listened as he got out of the truck. He was walking to the door. He picked up the bottle and read the note. I could see him out the window, and he looked like he didn’t know what to do. Then, he knocked on the door. I opened the door. He handed me the two bottles of chocolate milk, and I was so happy. I kept saying to myself, “It worked! It worked! He left, and I closed the door. I looked at Margie, and she had a look of disbelief on her face. It hit me like a slap in the face. She needed white milk for cooking supper! She always needed it for something. And she made us drink milk for supper every night. Oh, my gosh! I really was in trouble this time! I looked at the chocolate milk in my hands. It sure looked good. I could hear Junior getting up. He wanted to know why we were making so much noise. He came into the kitchen and saw me holding the chocolate milk. Margie didn’t even wait a second to tell him what I did. He just started laughing and laughing like a big jackass. He just reached over and grabbed a bottle out of my hand. He took the cap off and drank nearly the whole bottle! I opened the other bottle of chocolate milk and took a big drink out of it. I figured if I was going to get a bad spanking I might as well enjoy the milk. I drank the whole bottle. Junior drank the other entire bottle. I decided I would wash both bottles out and try to make Mother think the milkman didn’t come today. Deep down I knew this was not going to work. Even if it did work, I knew Junior or Margie would tell on me. The day went by so fast. I was hoping Daddy would get home early from work so he could help me. He wouldn’t let Mother beat me to death. He always made her stop if she gave me too many licks. I could see her walking down the path to the house. I was getting real scared. I didn’t know what to do. What I usually did was just tell her the truth if I knew I was caught and take the punishment. Daddy told me a long time ago to do that, and she might not spank me as hard. So, I guessed that was what I would do. I would fess up and take my spanking like a big girl. Mother came in the back door, and she looked tired. I didn’t know where to begin. Then, I looked up, and there was Daddy. He said hello to her and gave her a hug. “Let her tell us what she did, Mother,” Daddy said. “Ruthie, you knew that was wrong,” Daddy said. “Let’s go to the bedroom. You’re getting a spanking,” Mother said. She held her hand out for Daddy’s belt. He took it off real slow. I know he felt bad for me. I deserved it though, and I knew it. I wished I could learn to make better decisions. I don’t know why I always thought things were such a good idea. Then, I wound up in trouble. She made me bend over the bed and gave me a hard whack with the belt. I stood up as usual, and she had to hold me up to finish spanking me. I would just go limp like a dish rag. The door opened, and it was Daddy. He took the belt from her. “What am I gonna do with you, Ruthie?” Daddy said. He picked me up and hugged me and called me his baby Ruthie. I never did that again; I can promise you. Margie and Junior were in the living room laughing at me. I didn’t care. I hated them both anyhow. They had no imagination at all. I had to think up all the good stuff. I know for sure I am the smartest now. 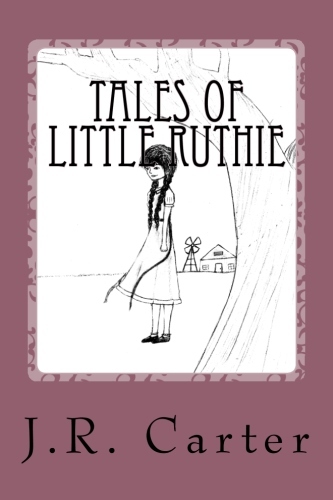 I was just another day and another spanking for little Ruthie. Janice Sautter is a great great grandmother who spends her time writing, painting, drawing, and playing video games. She lives with her husband Jim and their two dogs, Daisy and Lilly. She writes under the name of J. R. Carter.